Paneer cutlet with millet, i tried this for the first time in a cookery class here in Singapore. Even when i was trying this at home before the class, it was a loved by everyone. Also it was a super hit recipe in the class too. Paneer and cooked millet are the main ingredients and gram flour |kadalai maavu is used for binding. It is a perfect starter for parties. Also you can stuff this inside the burger and serve for kids. 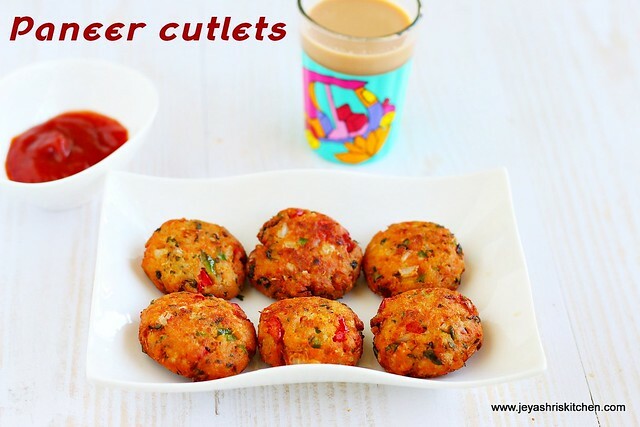 I won't say this is a healthy cutlet recipe but you can make it healthy by cooking the cutlets on a pan. If you have paneer cubes crumble the paneer by putting them in hot water for 10 minutes. Ensure it has not much moisture. I used the samai millet | barnyard millet. I cooked 1/4 cup of millet in 1/4 cup of water in pressure cooker for 3 whistles. Chop the onions, capsicum, coriander and mint leaves very finely. In a wide bowl, add the crumbled paneer, cooked millet, besan, capsicum, onion,red chili powder, garam masala, salt, coriander leaves and mint leaves. Mix this well. Ensure the mixture is dry and tight. If you feel it is loose add 1-2 tblsp extra gram flour| kadalai maavu. 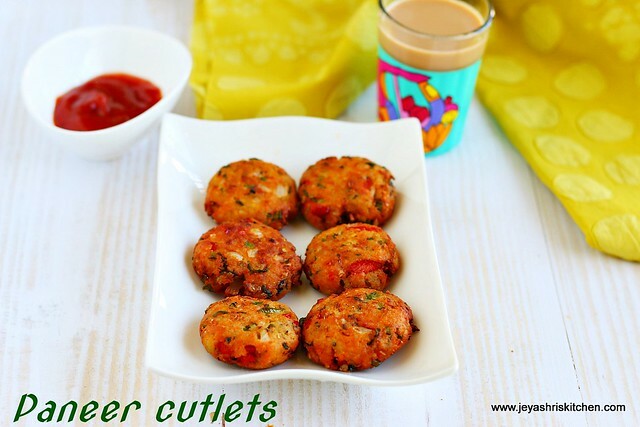 If you are planning to tawa fry this cutlets, dry roast the besan flour and add. Take a lemon sized portion of the dough. Flatten it as we do for cutlets. Else you can make it as an oblong shape. Once you are done with shaping, if you have time, keep it inside the refrigerator. Else you can start frying the cutlets. You can keep it for a day and fry later too. Heat oil for deep frying. Keep the flame in medium. Fry the cutlets in batches. Fry till it turns golden brown colour. Do not keep the flame too high, else the inside will not get cooked. I used barnyard millet(samai). You can use any millet of your choice. Ensure the rice is not cooked with too much water. Instead of besan flour, you can use rice flour or maida too. Finely grated carrots, broccoli can also be added. Always fry this in a medium flame. Instead of paneer potato can be used. You can tawa fry the cutlets, if doing so dry roast the gram flour for 5 to 7 minutes till emits a nice aroma and add to the paneer mixture. Paneer cutlet with millet stays good even after 30 minutes from frying. The recipe says cooking 1/4 cup of millet in 1/4 cup of water. So what about the rest of the millet? As under ingrediants you have said 1 cup of millet. When you cook the 1/4 cup of millet it will give 1 cup of cooked millet.